We’re so proud to release Mongobooster 3.0 today. In this brand new version, it gets more and more useful with our full-featured shell and several new tools. New free edition added with Mongobooster 3.0, this free edition is free for personal/commercial use but limited function. Schema Analyzer is a very useful build-in tool. Due to schema-less feature, collections in MongoDB do not have a schema document to describe field’s datatype, collection structure and validations. With our brand new Schema Analyzer Tool, you will get a document to describe the schema of certain collection from sampled(random, first, last) N or all records. The document shows the probability of sampled objects , different types percentage, you could get a brief of certain collection’s schema. If you want more accurate result, you could sample more records or analyze whole collection, but it may took a long time to finish if the collection has millions records or thousands fields. Create a large collection with random but “real data” is available in Mongobooster 3.0. We now provide more than 100 templates to create random faked “real” data, and you can use this tool to create test data with incredible large size. You could also define how much data is blank too, and how many docs to create. All settings will generate a script in the shell, and you could customize it with more complex business logic. 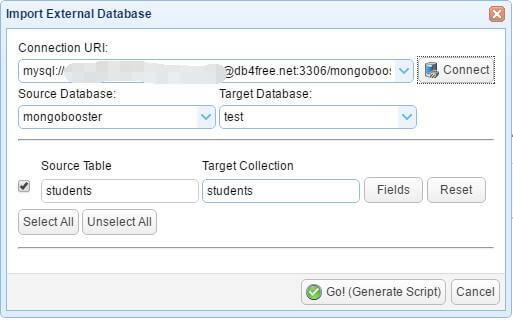 In case you want to transform a project’s database from MySql to MongoDB, or need to import data from 3rd party database., now you could do it through our RDBMS data import tool. We now support MySql, PostgreSql and MSSQL. Like test data generator, you could just config it on UI or write more complex business logic in the shell. You could unlock temporarily of a locked config by using the unlock button too. The temporary lock/unlock only affects current tab. We added import RDBMS to MongoDB, on the other hand, we also provide export MongoDB database/collection to .sql file. 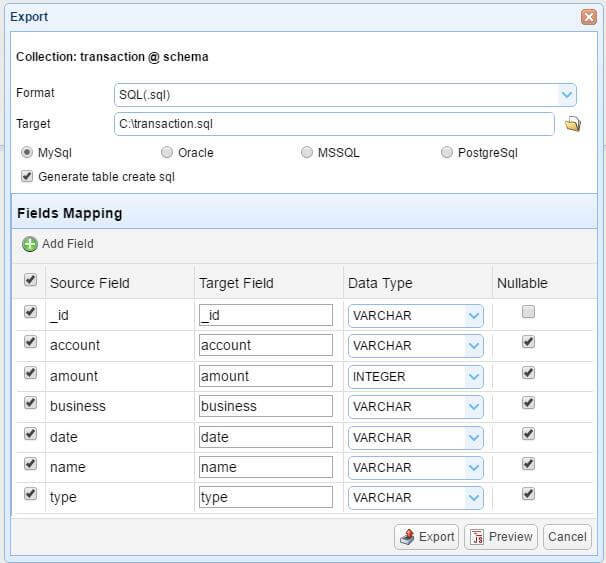 Supported dialect includes MySql, MSSQL, PostgreSql and Oracle. Like test data generator and import RDBMS to MongoDB, we put all the export/import/copy logic in the shell, you could review the code to make your changes. The progression is shown in the console.log/print tab. Added, show capped:true in collection stats tooltip.